Water damage comes from a number of sources, such as storms and plumbing issues. 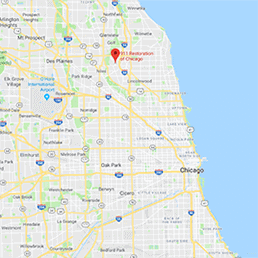 Our water damage Glenview crew knows their way around water extractions for both of these incidents because 911 Restoration Chicago has over 35 years of experience in all disaster restoration services. When rain blows in from off of Lake Michigan or your water line collapses during the winter freeze, we will respond within 45 minutes to help you overcome the floods. Glenview, IL actually has a number of small bodies of water that ultimately feed into the Great Lake. Glenview Creek empties into the Chicago River. When these waterways flood, your property is in trouble. We will respond within 45 minutes with the latest drying technology to provide you with water damage restoration services that include a free inspection and an affordable price on water removal. Call our water damage Glen view team for same day service when you have a pipe burst. We carry a whole suite of restoration services so that we can help you no matter what happens. We know the stress and trauma that follows floods and we strive to alleviate those two elements from the situation. To do this, we are working with all insurance companies to bring you an affordable price. Call our water damage Glenview personnel for low cost, quality water removal. The cost of water damage varies from job to job due to a number of factors, though our water damage Glenview staff promise an affordable price and have seen homeowner’s insurance policies pay for the entire service. If you have homeowner’s insurance, kept up with regular maintenance, and the leaks started inside your home, chances are you will not have to pay anything. If your building floods from the nearby Chicago River, you will need a separate flood insurance policy. The Insurance Information Institute has done studies that show floods and storm damage are frequent causes of insurance claims, so it is important that you carry both types of polices. To help you with upkeep on your roof and water system and avoid the negligence clause, 911 Relation Glenview offers a free inspection that will show you how to clean rain gutters, align downspouts, install a sewage back flow valve, and replace appliances as needed. Call us when you are looking for the best water damage Glenview company and we will respond within 45 minutes to start pumping water from your home or business. The best water damage restoration company is 911 Restoration because our water damage Glenview experts always put the customer first when it comes to leaks and floods. We have over 35 years of experience in the industry, so we know the toll it takes on everyone involve. It can kick families out of their homes, close business in the village of Glenview, and cause serious health issues. When your building takes on water call us for water damage Glenview services and we will set you on the path to a fresh start.